This guide is your first step to get up and running with the Testimonial Rotator WordPress plugin. Here is a complete list of available attributes that can be passed to the Testimonial Rotator through the shortcode or directly called in PHP. In this video, I will show you how to create a custom testimonial rotator submission form. How to show the total rating of a rotator. A demo page of all the different layouts. You can easily change the styles of your testimonial rotator, this includes the font size, colors and borders. Testimonial Rotator themes install like any other plugin and the best place to start learning how it works is by downloading the sample theme. If you want to add some locations in a theme for testimonials to appear, follow this tutorial. Here is a rundown of all the filters available for you to use and add functionality to your rotator. Easily change the stars to a different icon. This article shows you how to change the number of testimonials to display when using ‘format=list’ in your shortcode. By default this plugin creates a testimonial archive page. This code snippet allows you to change what the url (or slug) will be. This article shows you how to add some simple code to your site to change the speed of your rotator. Easily add pagination to your listview of testimonials. Here is how to easily add prev/next button to your testimonial rotator. Also some guidance on styling them to match your theme. Easily change the star rating color with one line of CSS. In this article I’ll give you a small snippet that allows you to change the order the testimonials appear in your rotator. Add this filter to remove the archive page created by this plugin. How to reload any old version of this plugin in case something goes wrong. 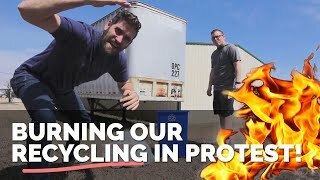 BURNING OUR RECYCLING IN PROTEST!